500 STRIPED NEON Neon Blue - Neon Red, 3/4 INCH TYVEK WRISTBANDS - The 500 wristbands are packaged in sheets of ten. Each wristband measures 3/4 inches wide by 10 inches long and will fit any size wrist. Each wristband is numbered for security and identification. Our Tyvek wristbands are water resistant and have a waterproof adhesive to stay on in the water. They are perfect for short-term use at any event and have security diecuts to prevent tampering and multiple use while still being comfortable and easy to put on. Our Tyvek wristbands are made from a high-grade, synthetic paper which is extremely strong and don't tear or stretch. DuPont, the inventors of Tyvek, don't recommend using standard laser printers to print on Tyvek (it will probably melt), if it's printed in Inkjet the ink will be dispersed. 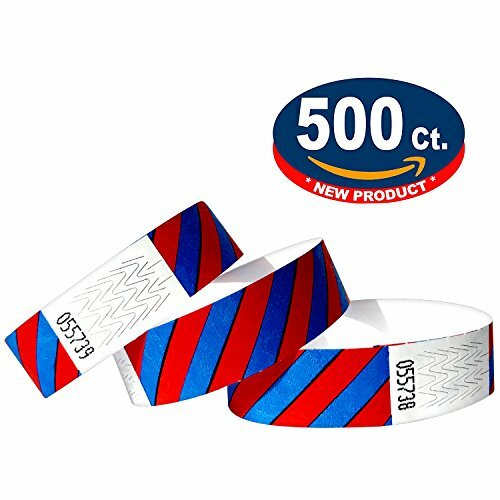 500 STRIPED NEON Blue + Neon Red, 3/4 INCH TYVEK WRISTBANDS - The 500 wristbands are packaged in sheets of ten. Each wristband measures 3/4 inches wide by 10 inches long and will fit any size wrist. Tamper-resistant adhesive closure that prevents transfer of the wristband. Trusted supplier. Our wristbands have been used in thousands of events worldwide. We sell superior quality products at the best price. If you have any questions about this product by Eventitems, contact us by completing and submitting the form below. If you are looking for a specif part number, please include it with your message.